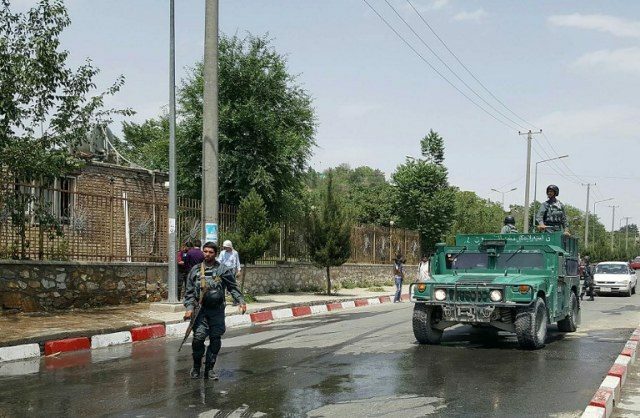 A suicide bomber blew himself up in front of a government ministry in Kabul on Sunday as workers were leaving their offices, killing at least seven people and wounding more than 15, officials said, in the latest deadly attack to rock the country. There was no immediate claim of responsibility for the explosion outside the Ministry of Rural Rehabilitation and Development, which was the second time in as many months that its compound has been struck. It follows a series of attacks in the eastern city of Jalalabad in recent weeks that have killed dozens of people. Most of those assaults were claimed by the Islamic State group. Civilians and security forces were among the seven dead in Monday’s attack, police spokesman Hashmat Stanikzai said. The death toll was confirmed by an Afghan security source. Ministry spokesman Fraidoon Azhand said the bomber struck at a security gate as employees were exiting the compound during rush hour. But it was not clear if the ministry was the target of the attack. Stanikzai said security forces and a vehicle belonging to foreign advisers to the ministry were in the vicinity at the time of the attack. The vehicle was damaged in the blast but there were no foreign casualties, he added. On June 11 a bomber blew himself up as ministry workers queued for an early bus home during the holy month of Ramadan, killing at least 13 people and wounding 31. IS claimed responsibility for that attack. Sunday’s blast came hours after a UN report was released showing a record number of civilians killed in the first six months of 2018, with militant attacks and suicide bombs the leading causes of death. But the suspension of hostilities was marred by two suicide attacks in the eastern province of Nangarhar that killed dozens of people and were claimed by IS, which was not part of the ceasefire. Suicide bombs and “complex” attacks that involve several militants accounted for 1,413 casualties — 427 deaths and 986 injuries — up 22 percent from a year earlier. UNAMA attributed 52 percent of those casualties to IS, mainly in Kabul and Nangarhar where the group established a stronghold after emerging in Afghanistan in 2014. The Taliban was responsible for 40 percent. While the Taliban is Afghanistan’s largest militant group and holds or contests more territory than any other, IS has repeatedly demonstrated its ability to carry out devastating attacks in urban areas.